It's time for another week's Fine Motor Fridays, a collaborative weekly series where we share playful fine motor skills activities. Today my contribution is filed under Fun Easter Egg Ideas! I've added some affiliate links to help if you want any specific materials. 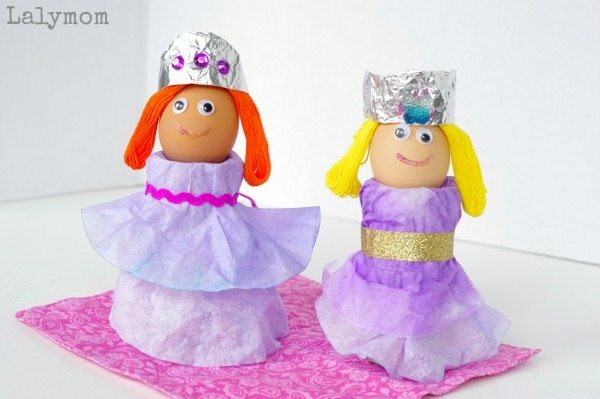 These coffee filter princesses are the perfect Egg Cups if you have a princess fan in the family! The end result took a little longer than I thought it would due to the drying time for the watercolor coffee filters. I'd say it was worth the wait though, my little princess was very proud of the crafts we made together today! You might notice that one of the princesses had a wardrobe change between one photo and the next. 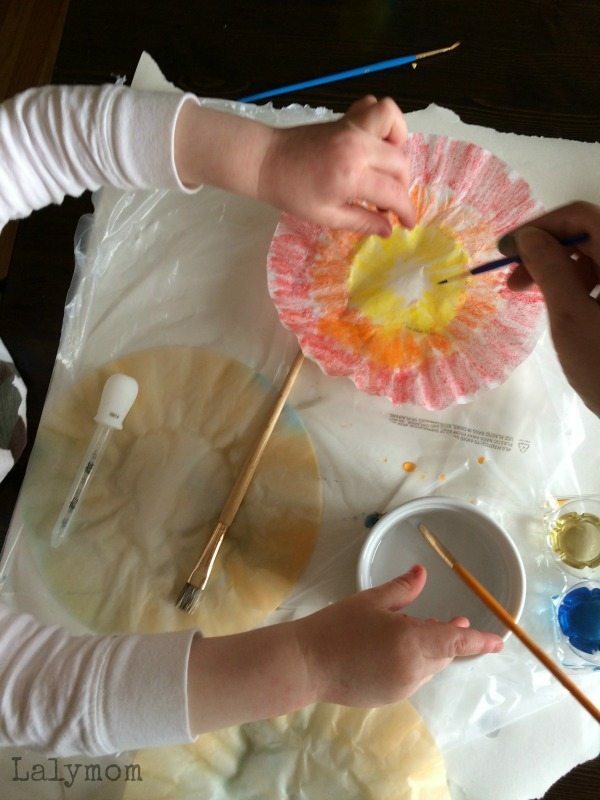 Between big sister, little brother and mom, we made a LOT of colorful coffee filters today! Okay I am going to get right to the tutorial because I feel like I have a ton of pictures of the process. 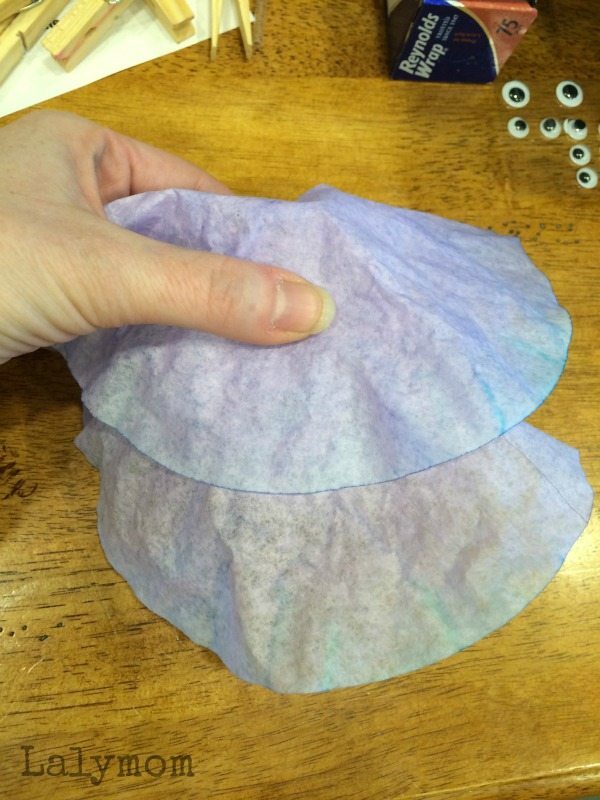 Coffee filter colors – Pick one or try them all; see results in the picture below! 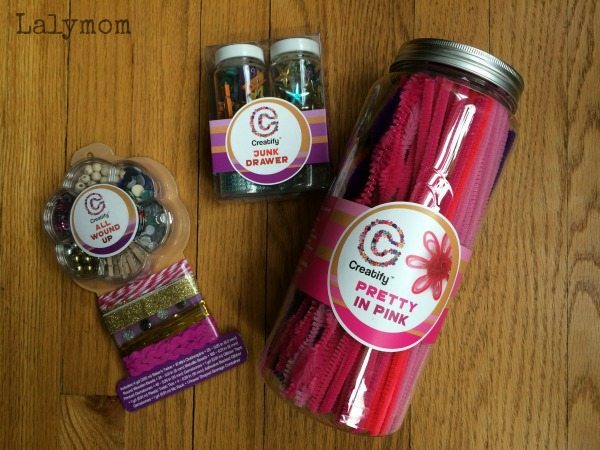 We broke into our awesome craft stash from our friends at Creatify to glam out our princesses! Creatify kits are available in store at Target and they are a lot of fun! Cover your work surface to protect it from water and color drips. If using liquid watercolors, place a few drips of liquid water colors into various small containers and add water. Add more watercolors for stronger colors and less for delicate, pastel colors. 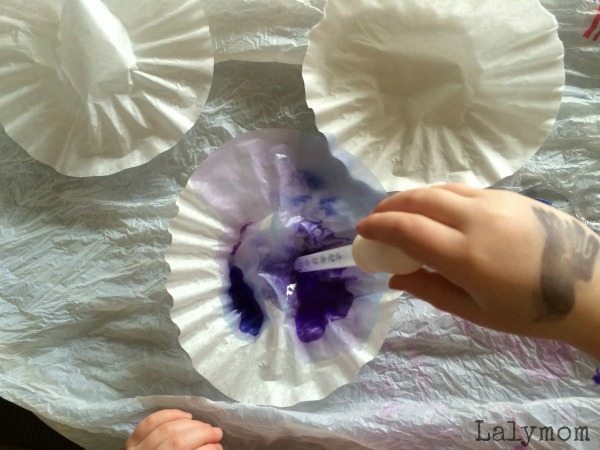 Use and eye dropper to transfer water to the coffee filters or you can dip them into the colors. 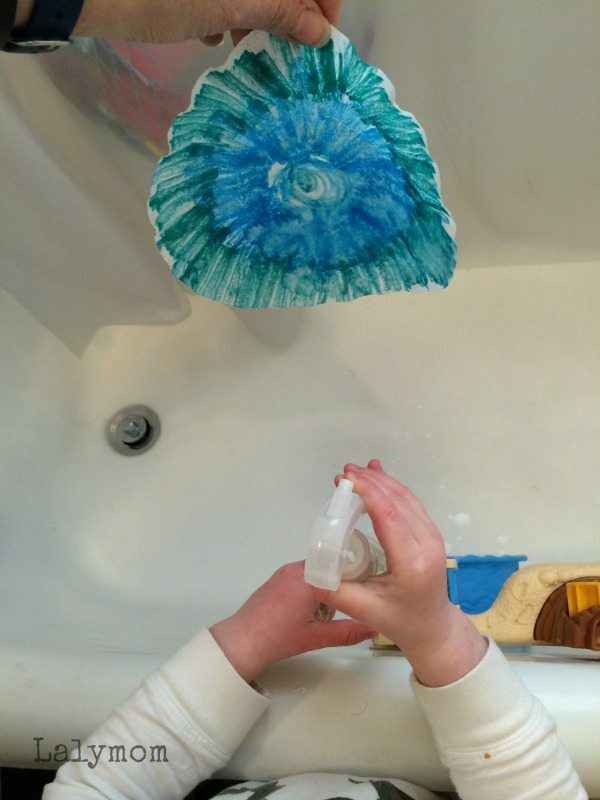 If using washable markers, color the filters as thoroughly as possible. When finished squirt lightly with the spray bottle. 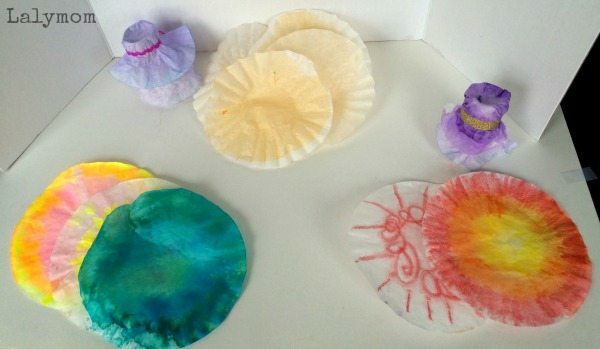 If using gel watercolor markers, color and design your coffee filters and experiment with spraying versus using a wet paintbrush to spread the colors. 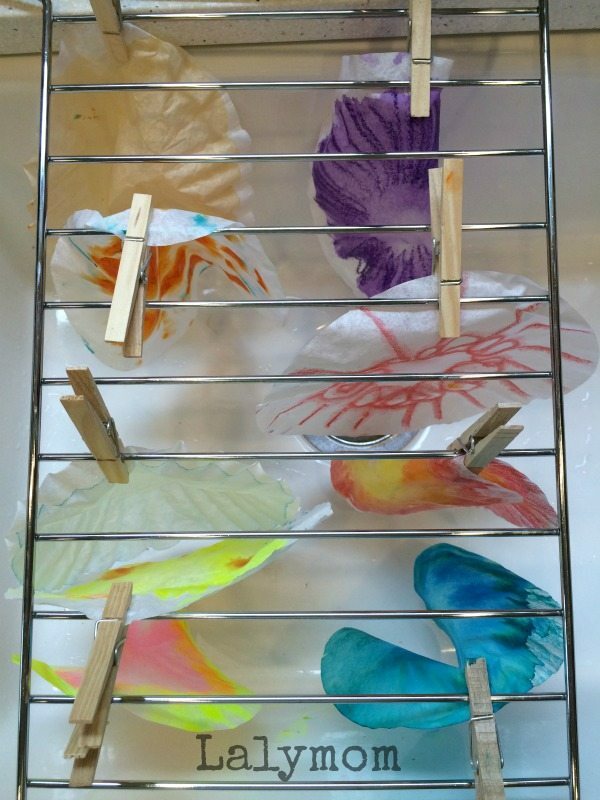 Hang them to dry using clothespins and a wire rack. The colors will drip, just pay attention to where you set them to dry. Once your coffee filters are dry, take two coffee filters and overlap them part way then center the top one over the hole in the toilet paper roll. Fold them down and around the roll to start making the dress. 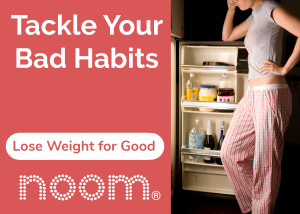 Use twine, pipe cleaner, ribbon or other materials to make a belt, flaring the skirt out at the bottom. Do not pull the coffee filter taught over the toilet paper roll, leave some slack so that the coffee filter can settle down into the hole when you place the egg on top. 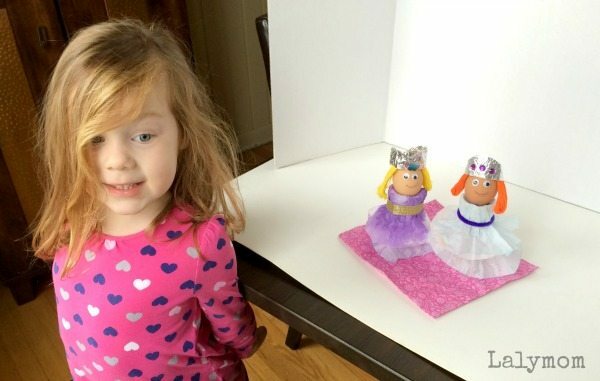 Using a hard boiled egg, draw a face or add googlie eyes and glitter glue mouth. Take a skein of embroidery floss and fold it in half for easy hair that can be reused in other projects. Fold a small piece of foil and decorate with jewels. 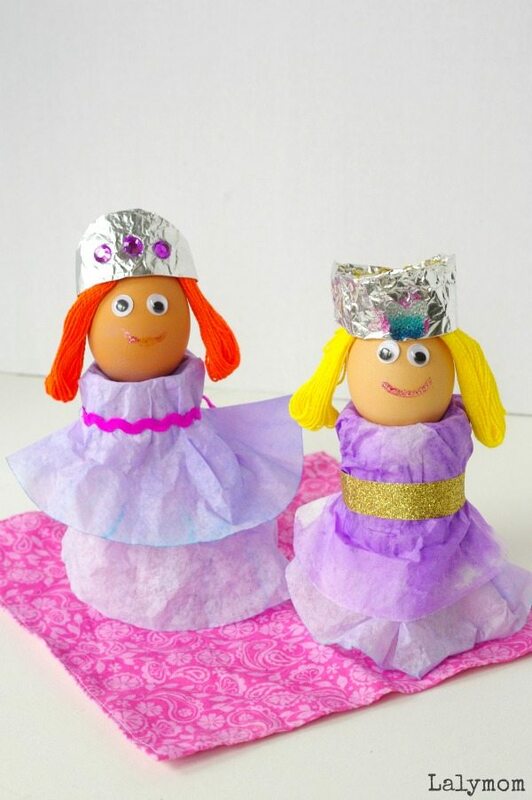 We just set our hair and crowns on the eggs but you can glue them if desired. 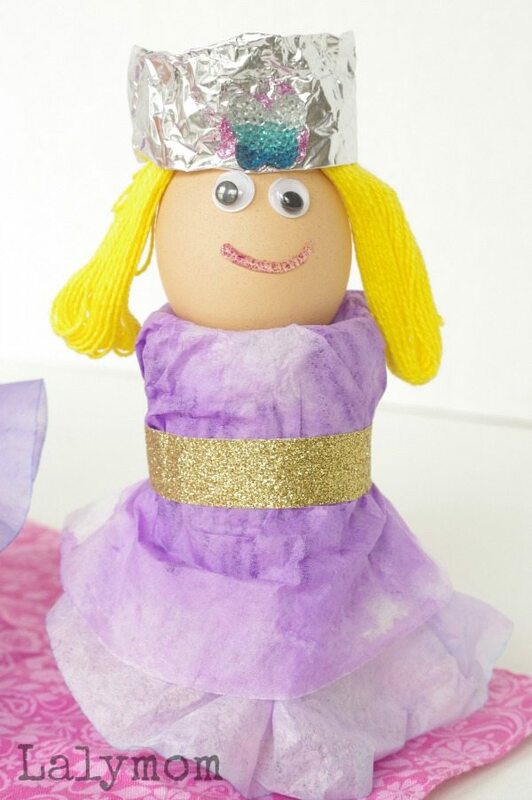 Once the face is dry you can set your egg on the gown and fix her hair and crown. Finally you have beautiful princess egg cups! If you like this project please do pin it! What are your favorite Easter Egg Ideas? I'd love to hear about them in the comments! For more ideas follow my Easter Pin Board! Follow Laura @ Lalymom Kids Crafts & Activities's board [Holiday] Easter DIY & Activities on Pinterest. Be sure to click through the links below to see what my fellow Fine Motor Fridays friends have been up to this week! You can follow along with all of our activities at the Fine Motor Fridays Pinterest board and don't miss our Fine Motor Fridays book! Laura is a Chicago stay at home mom to two sweet redheads born in 2010 and 2012. She keeps them happy and learning with a variety of arts, crafts and activities.